A rainbow the wrong way round! Upside down rainbows are very rare. They are hard to see because they are usually hidden by clouds and are very high in the sky. They are caused by sunlight bouncing off ice crystals high in the atmosphere. 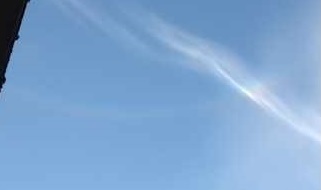 They occur when thin whispy cirrus clouds made of ice crystals when they are at a certain angle to the sky.